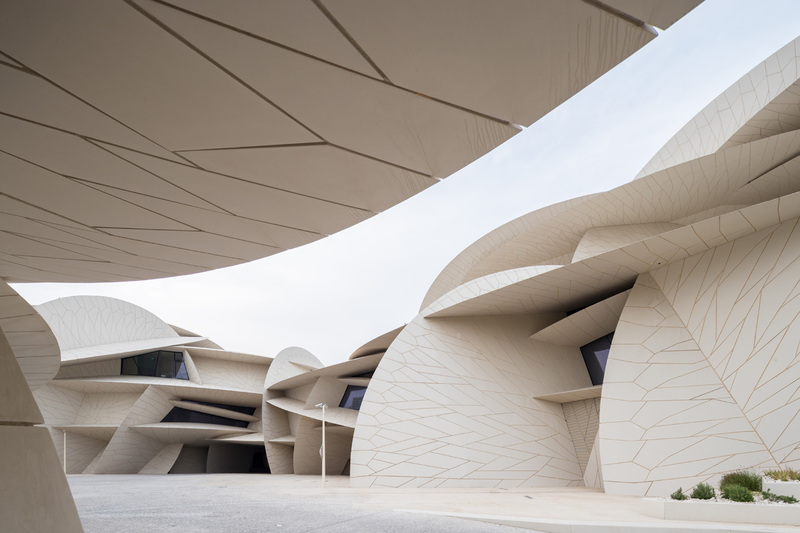 The National Museum of Qatar emerges from a desert that has ventured all the way to the sea. 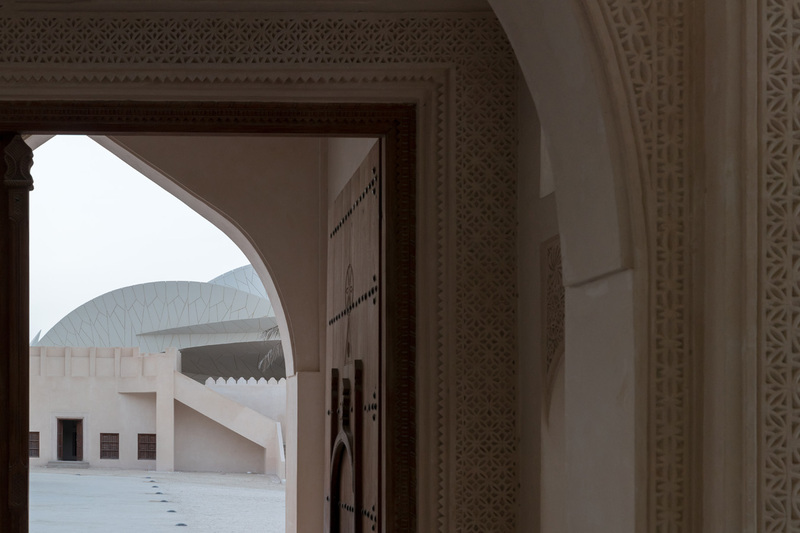 On the site, the Royal Palace of Sheikh Abdullah bin Jassim Al Thani rises up, a twentieth-century landmark of major heritage value to Qatar. 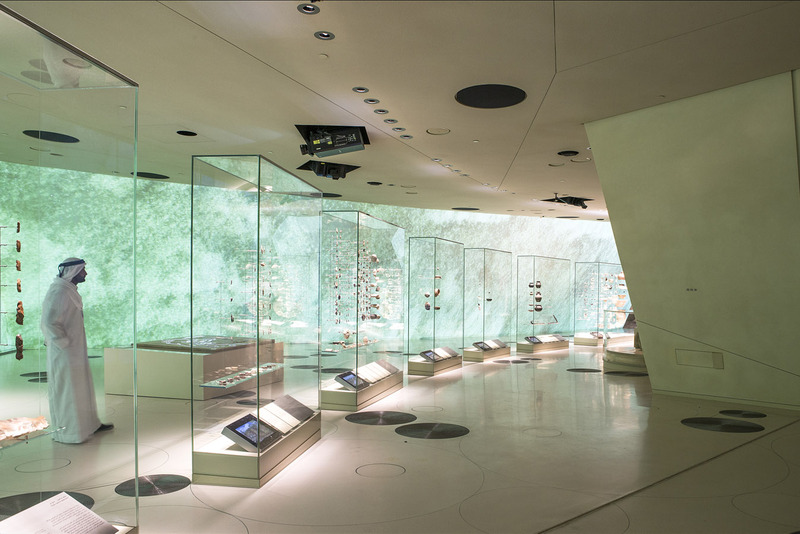 The National Museum is dedicated to the history of Qatar. 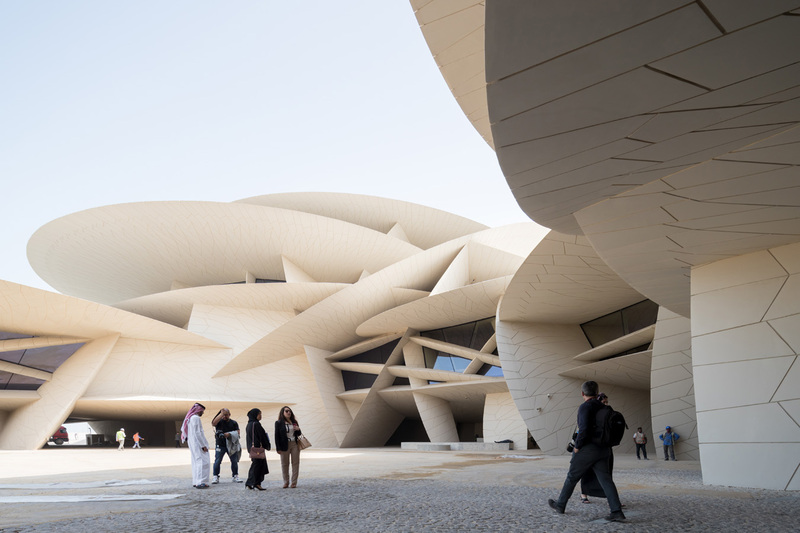 Symbolically, its architecture evokes the desert, its silent and eternal dimension, but also the spirit of modernity and daring that have come along and shaken up what seemed unshakeable. So it’s the contradictions in that history that I’ve sought to evoke here. 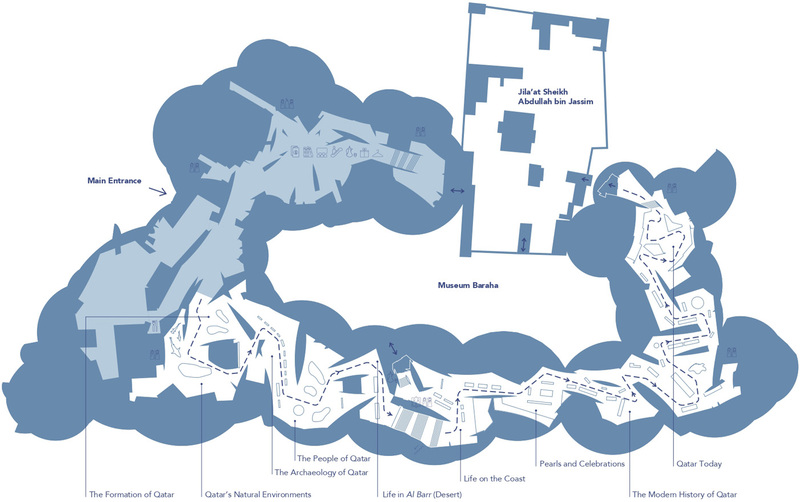 Qatar is also about the peoples who settled along the seaboard, setting up these coastal towns that became ports of call for passing nomads as much as local fishermen and pearl divers. And so the native fauna and flora, and the nomadic peoples and their long-held traditions, are the very first features of the history of Qatar. Three economic miracles occurred to shake up this overwhelming tranquillity. The first, dating from Roman times, was associated with pearl fishing and the pearl trade. The second, in the aftermath of the Second World War, was the amazing discovery of oil, followed twenty years later by the discovery of another treasure: gas. 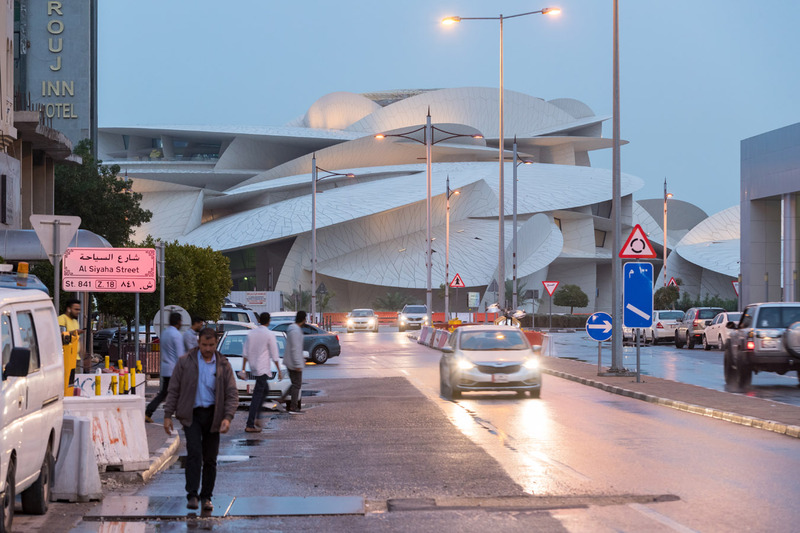 The desert peninsula of Qatar and its people suddenly saw enormous, dazzling change and the country turned into a real crossroads, alluring and open, and attracting visitors from far and wide. The building I designed needed to reflect these three different stories. The first, which covers a long period, is the story of the peninsula and its inhabitants. The second is an exploration of the coastal and desert lifestyles as well as the pearling industry, and third covers the spectacular acceleration that gave the kingdom – in just a few decades – the power and prosperity we associate with it today. Because of its economic power, Qatar has become a world leader in fields as diverse as education, communications, and energy technology. 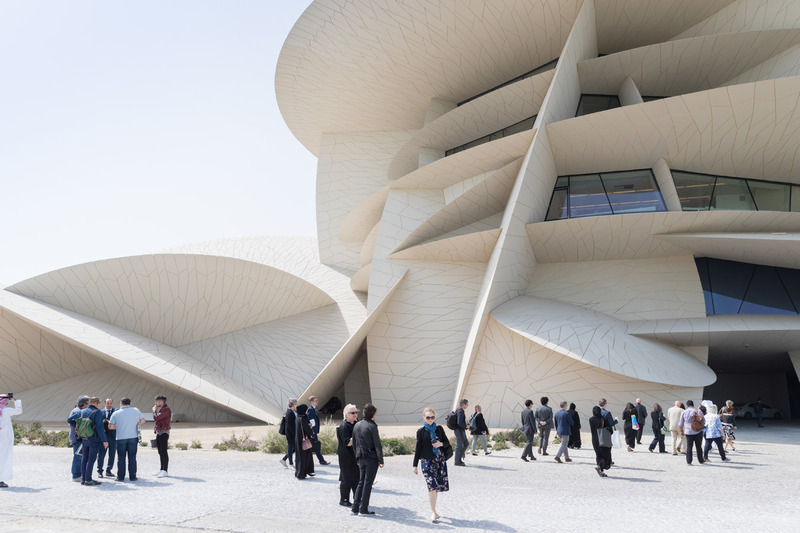 The desert rose, a flower-like aggregate of mineral crystals occurring only in arid coastal regions, is the first architectural structure that nature itself creates, through wind, sea spray and sand acting together over millennia. It’s surprisingly complex and poetic. Taking the desert rose as a starting point turned out to be a very progressive, not to say utopian, idea. 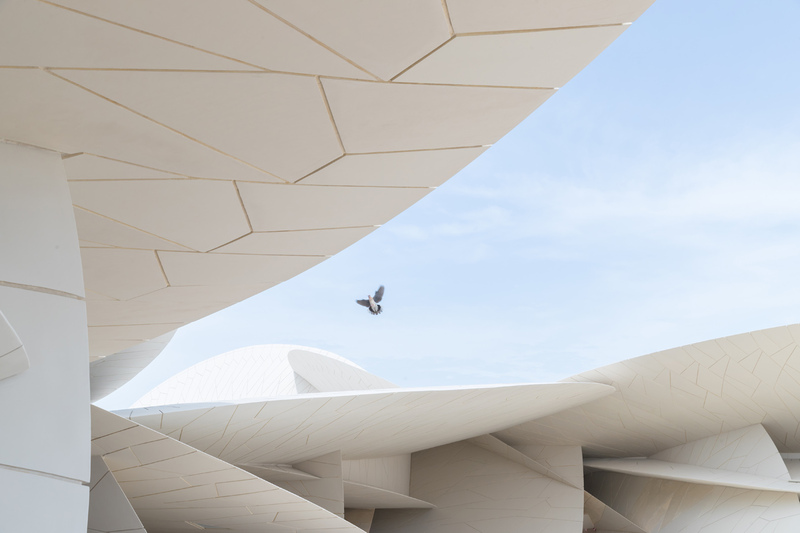 I say ‘utopian’ because, to construct a building 350 metres long, with its great big inward-curving disks, and its intersections and cantilevered elements – all the things that conjure up a desert rose – we had to meet enormous technical challenges. 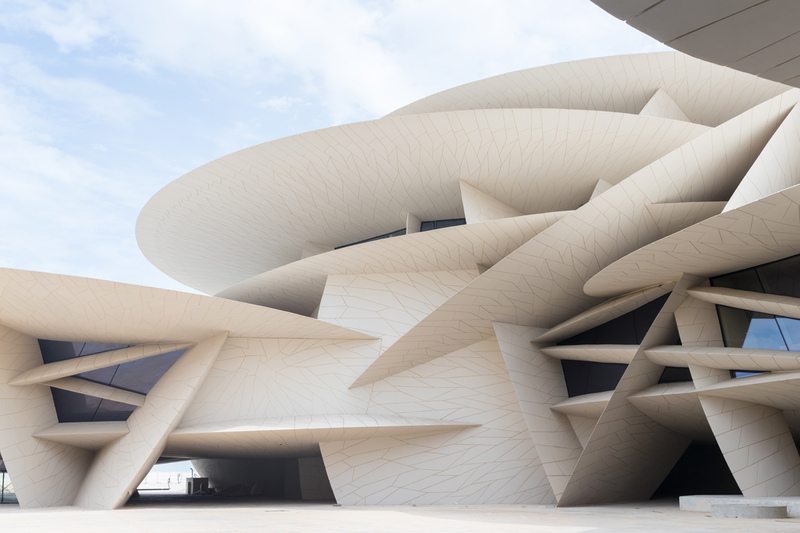 This building is at the cutting-edge of technology, like Qatar itself. 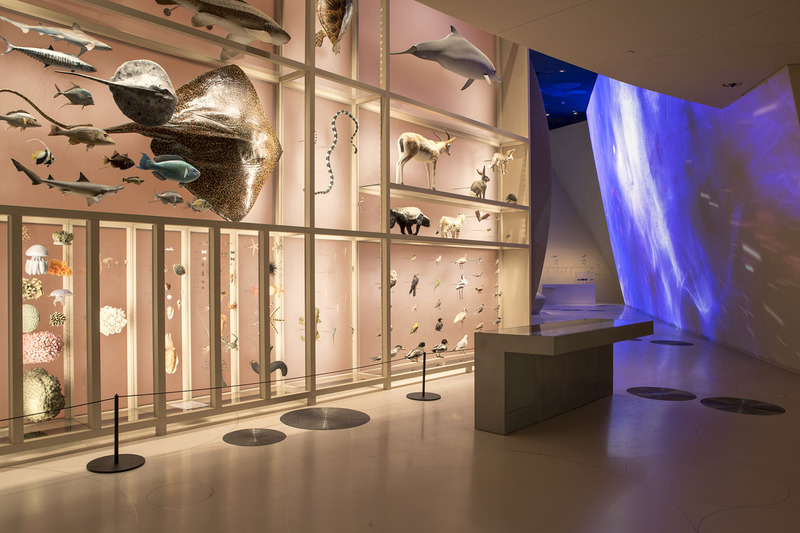 The museography that grew out of this specific history and these specific considerations provides an experience that’s architectural, spatial and sensory all at once. Inside, you find spaces that don’t exist anywhere else in the world since it’s the interlocking of all these disks that forms the building, inside and out. The result is a construction made of geometric spaces. I owe my love of things that aren’t quite vertical to one of my teachers and mentors, Claude Parent, with whom I worked a great deal. A number of floors are on an incline. You walk under them, you walk up, and you become aware that there are hardly any vertical lines anywhere. Looking more closely, you can find a few elements that appear to be vertical but, in reality, are not. You only get the impression they are because that’s the natural scheme of things. The museum occupies a vast area. From the moment you step inside you’re struck by the relationship between the form and the scale, between the theme and the different eras dealt with… between the small desert rose that comes down to us from out of the mists of time and this outsize creation. As for the desert, it’s always there, even if it has morphed into something else completely. As you walk through the different volumes, you never know what’s coming next in terms of the architecture. The idea was to create contrasts, spring surprises. You might, for instance, go from one room closed-off pretty high up by a slanting disk to another room with a much lower intersection. This produces something dynamic, tension. As in a lot of other museums, the circuit forms a loop. The complete tour takes about two hours and ends in discovery of the old Royal Palace, which has been restored. From certain points, you can access the Baraha. Following the time-honoured template, this is a central courtyard surrounded by buildings where travellers would come and unload their merchandise. The Baraha gives an idea of the scale of the Royal Palace. It’s a sheltered space, with the museum built around it. Thanks to disks tilted at different angles, it also offers shade. 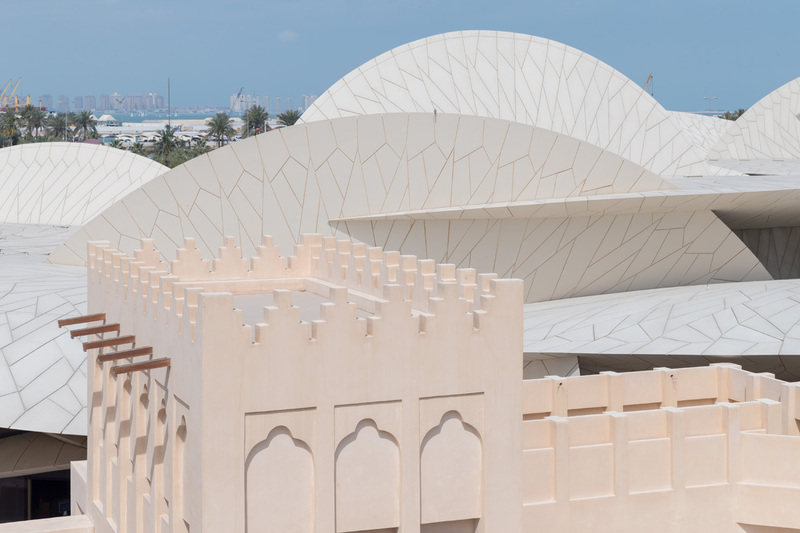 This space can accommodate outdoor events, performances, theatre pieces, events connected to the exhibitions. The Baraha is also connected to the outdoor spaces of the old palace. From there, you can stroll along a promenade at the water’s edge. I wanted to create a structure that evoked the local geography and, in keeping with the tradition of the place, to ensure that it offers maximum protection from the sun. The building is extremely energy efficient. The disks that make up its structure are heavy and form a sort of cushioned barrier that acts as a sunscreen. When the sun hits the building from east or west, the disks cast long protective shadows. The building doesn’t have a lot of openings, and the few windows it does have are set back so that they’re always out of reach of the sun. The interior spaces can be air conditioned more economically as a result. 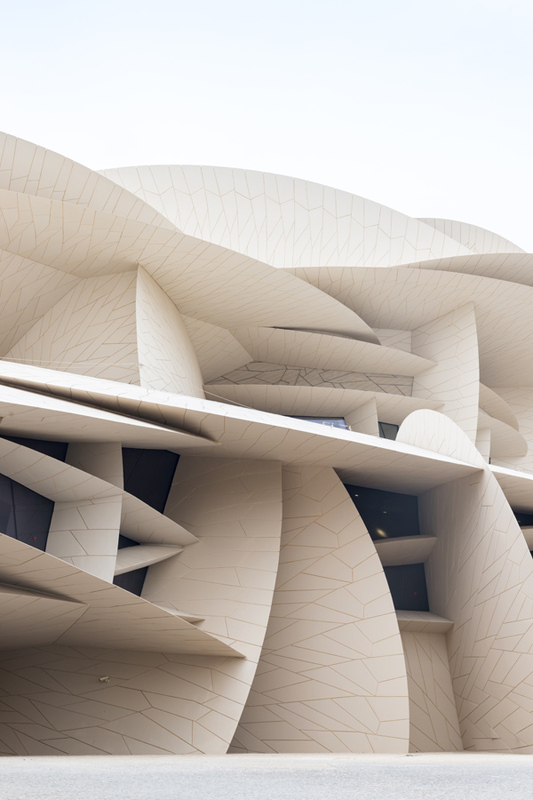 The skin of the building is made of high-performance glass fibre-reinforced concrete that’s the same sandy beige colour inside and outside the building. 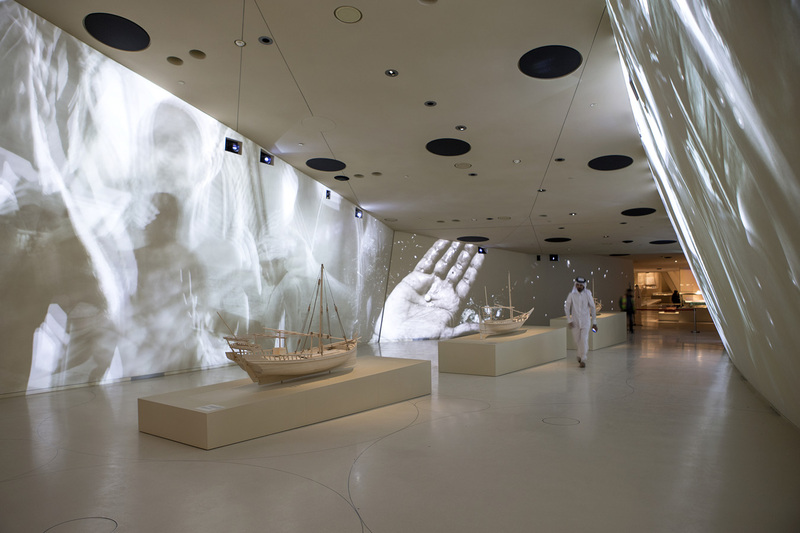 As for the museography, I have worked in close collaboration with the National Museum to launch the opening with a series of films that provide glimpses of different aspects of Qatar and its history. Made by filmmakers and video artists handpicked for their talent as creators of evocative poetic images, these films are sensitive testaments to past eras. They will never be shown anywhere else, as they’ve been made specifically for the museum and formatted to fit the shape and scale of the walls they’re screened on. 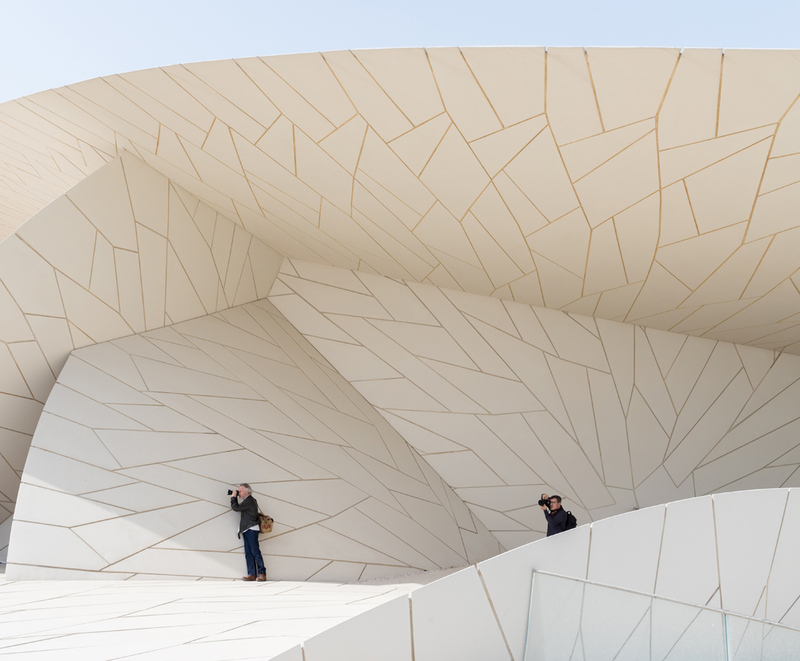 The films translate the way the architecture is tailored to the expression of a museography specifically designed to evoke the scale and power of the land and history of Qatar, from time immemorial to the present moment. 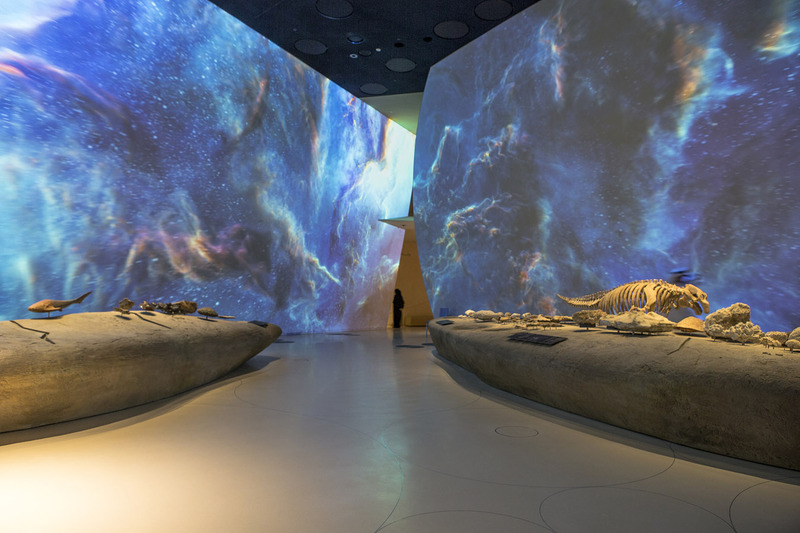 The immersive and experiential National Museum of Qatar (NMoQ) tells the story of Qatar and its people from earliest times to today, bringing to life the peninsula’s natural history, giving voice to Qatar’s rich heritage and culture, and expressing a vibrant community’s aspirations for the future. 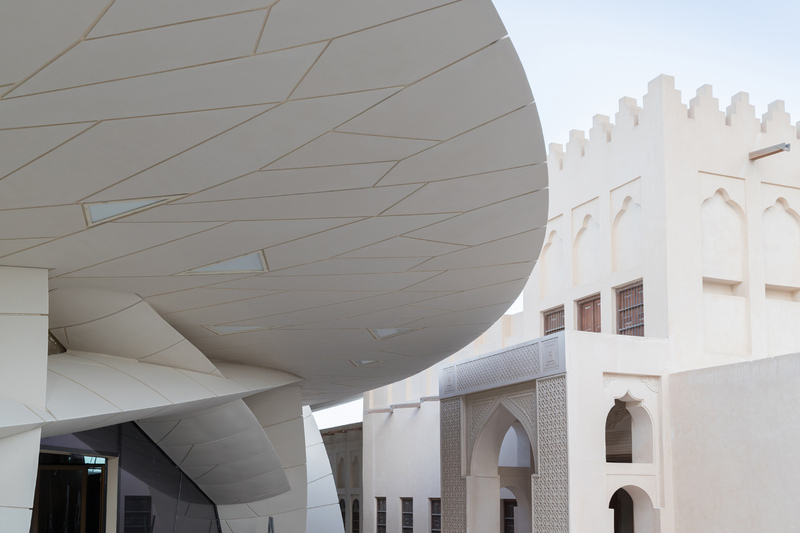 The new museum embraces, as its centrepiece, the restored historic Palace of Sheikh Abdullah bin Jassim Al Thani (1880-1957), son of the founder of modern Qatar: a building that in former times was both the home of the Royal Family and the seat of government and was subsequently the site of the original National Museum. 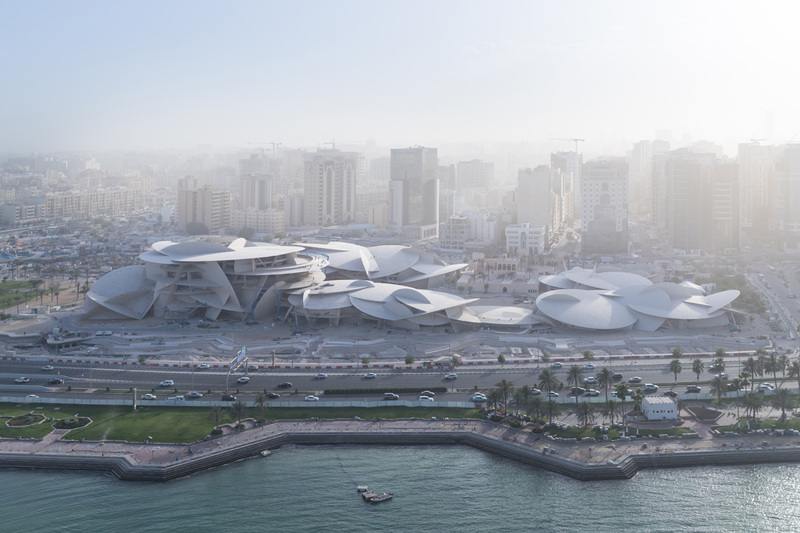 Jean Nouvel’s new building incorporates the Palace while seamlessly integrating innovative artworks commissioned from Qatari and international artists, rare and precious objects, documentary materials, and interactive learning opportunities. 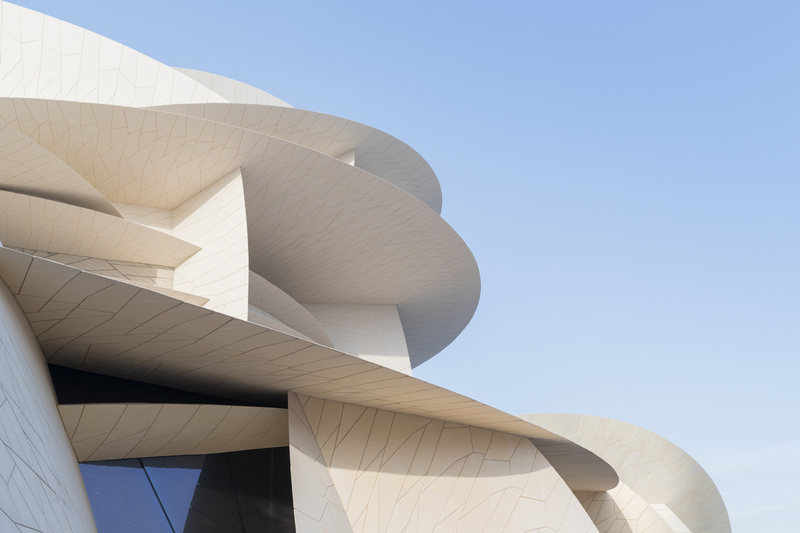 Located on a prominent 147,425 m² site on Doha’s Corniche, the new museum offers approximately 52,000 m² of enclosed space, including 7,000 m² for the permanent collections, 1,700 m² for temporary exhibitions, a 213-seat auditorium, two cafés, a restaurant, and two museum shops. Separate facilities are provided for school groups and VIPs. Staff facilities include conservation laboratories, staff offices, and collections management and storage areas. 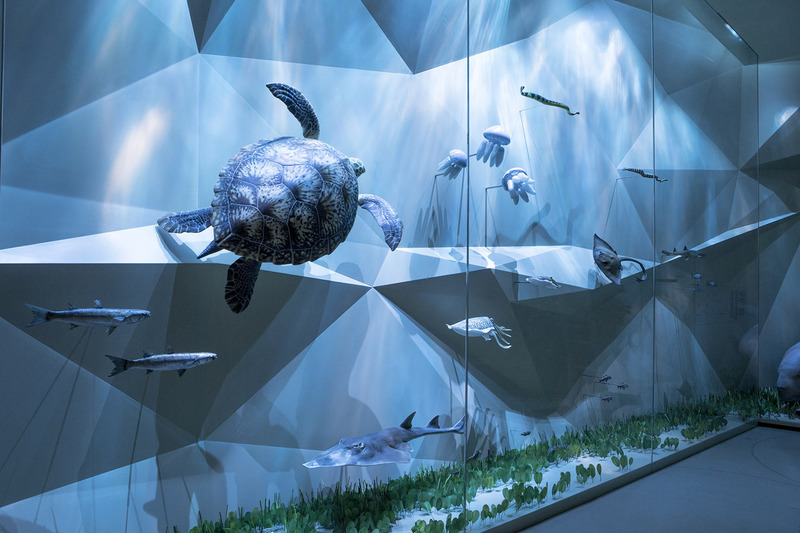 The museum is surrounded by a 112,000 m² landscaped park that reinterprets the landscapes of Qatar.